Spring is here, and clothing designers are introducing their newest styles in skirts, dresses, denim jeans, shirts, and halter tops. The mod, hipster, and retro fashion mavens among us tend to covet certain styles. However, to look your best, it’s also essential to select clothing styles that complement your figure. At first glance, the hourglass figure seems like the embodiment of feminine perfection. Men lust after it and women covet it. Surprisingly, we’ve found that hourglass-shaped ladies can’t wear everything. Too-tight clothes, like leggings and provocative halters, tend to look trampy. Too-big clothes, like baggy sheath dresses and very wide-legged denim jeans, tend to look sloppy. Read on to discover the clothing styles that flatter you, and get hip to the hottest clothing design trends, too. If you have an hourglass figure, play up your curves by selecting clothing with a defined waist. This year, designer Corey Lynn Calter introduced the “Raven” dress, a sheath, rust-color patterned dress with a slim waist. This dress accents your curves in all the right places without revealing too much flesh. Another flattering dress for your figure is the “Duo” strapless sailor dress by clothing designer Hype. This grey and magenta swirled sun dress, which features a front tie and side pockets, is perfectly filled out by your pretty figure. If you’re into A-line styles, add a belt to make a big splash and play up your intriguing lines. For example, the “Mod-est” dress by Jessie Williams is a short, flirty sheath-style dress with bell sleeves. You can wear this dress as beautifully as your boy-figured sisters if you cinch it with a wide belt at the waist. When buying this dress, opt for solid colors over patterns or stripes to flatter your curves. Formal wear is tailor made for hourglass figures. However, there are still certain dress styles that suit you better than others. One option we like this year is the “Cupra” white, strapless gown by Zeto. The black-colored tie-back evens out your figure, and the white, meshy tulle bust accents subtly play up your curves. Pair this long dress with the “Lovely Day” textured gold high heel shoes by Poetic License. When selecting pants, opt for cuts that balance your figure and play up your assets. For example, the “Electric Blue” skinny jeans by Paper Denim feature a higher waist that accents the curve of your hips, and ankle zippers that showcase your bottom half. If zippers aren’t your style, try the “Rose” grey straight leg denim jeans by Union. The full-coverage, low-rise waist and minimal pocket detailing play your curves like a melody. Joan Jett-style punk-rock denim jeans scream for cute flats. We like the “Night Velvet” textured plastic flats by Melissa Plastic Dreams, or the “Sadie” navy blue ballet flats by Pink Studio. Flares are always hot, and the hourglass figure can wear many flared styles. The “Isabella” jeans by Paper Denim feature a mid-rise waist, and bell-bottom legs that create long, dreamy lines. If denim’s a bit too casual for you, slide into a pair of Union Jeans’ flared corduroy pants in navy blue or grey. The soft, stretchy fabric hugs your curves in all the right places. Pair your flares with intriguing shoes, like the“Marta” square-toe, wooden heel T-strap shoes by Frye, or the “Sorbet” black leather high heel boots by Chie Mihara. Scoop neck tops are beautiful on ample busts. This spring, try the “Alice” organic cotton racer-back tank top by Velvet Leaf. The modest scoop neck and sailor tie gracefully accent your chest and shoulders. If you prefer fewer details, the “Oyashio” vest-style, scoop neck tank top by Dagg and Stacey offers a peep of cleavage and creates graceful lines. Flowing fabrics done right also accent hourglass figures – providing your shirt choices aren’t too baggy. The “Marcie” owl-print swing top by Corey Lynn Calter balances your curves, while the “Joni” ruffle-neck blouse by Dear Creatures is gently loose throughout, but slim right at the waist to play up your assets. When in doubt, classic tee shirts are never a bad idea. The young designers at Blood is the New Black have a few things in store for the curvy girl – check out their “Offering” and “Fists of Fury” tee shirts that feature sleek cuts, sweet cap sleeves, and big, bold printed graphics. If basics are what you need, try the women’s ribbed “Beater” tank top by Alternative Apparel. The cut draws attention to your neck and arms while hugging your body just right. Grab a few in black, rose, and green so you can mix-and-match your wardrobe. Edge of Urge is a mod, retro, hipster, and boho fashion boutique in Wilmington, NC. The clothing seller offers one-of-a-kind dresses, skirts, tops, tee shirts, denim jeans, and accessories, including brands such as Chie Mihara, Pink Studios Shoes, and the namesake “Edge of Urge” line. Visit our online boutique to shop 24/7, or to get current store hours. Selecting the right costume is never easier. For those with hourglass figure, clothing should perfectly fit the body. Knowing the importance of selecting the right clothing, the author of this article has explained the most wanted tips to find the tight clothing. 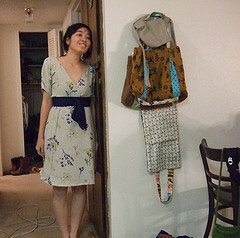 Being a great fashion designer, the tips provided by the Author are highly valuable.